It was a hoppin’ night in Nashville on November 07, 2017 as the excitement of CMA week began to descend on Music City. Our ultimate destination was the Blue Bar on Broadway but before we arrived there we strolled with the unwanted chill and gloomy fog and passed the BMI Building as fans waited outside for the guests of honor to arrive – including Keith Urban – for the 65th BMI Country Music Awards. Reagan Richards and Gordon Brown of Williams Honor in Nashville. Next, we headed for the 5 o’clock start of the “The Music Row Top 30 No Umbrella Pre-CMA Bar Frog Party” with headliners Williams Honor who were celebrating with their Bar Frog Music family the fact that their latest song “No Umbrella” has cracked the Top 30 of the Country Music Charts now at #28 as of this writing. Comprised of Gordon Brown and Reagan Richards the country act from the East Coast have received four nominations at the 2016 Asbury Music Awards including Album of the Year and Song of the Year. They have already been featured on Nashville’s FOX and NBC affiliates as well NJ’s own NEWS12NJ spotlight stories. They are called Asbury Park’s first ever country duo. 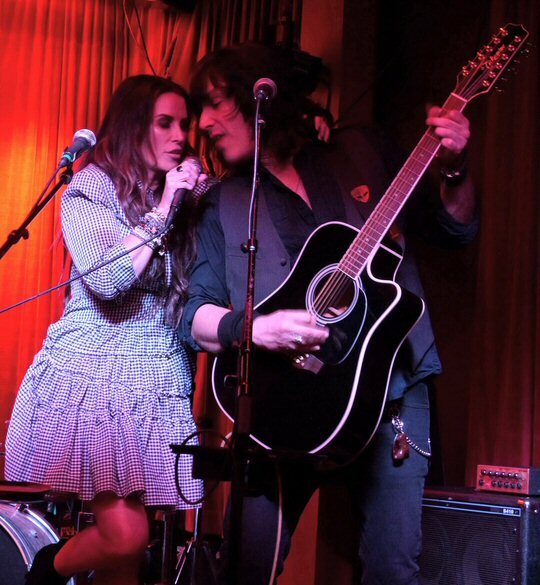 As you might expect they split their time in Nashville where some say they might be the next Johnny and June. Most recently they rocked the night away on Halloween as Gene and Paul. The pair had a vision to become the first modern country combo to hail from the famous New Jersey shore town. Their chart action and presence at this year’s CMA Awards at the Bridgestone Arena – where they were seen backstage hanging out with Little Big Town and Garth Brooks – are proof of their goal’s at least partial fulfillment. Next step – bring home one of those sharp looking trophies. 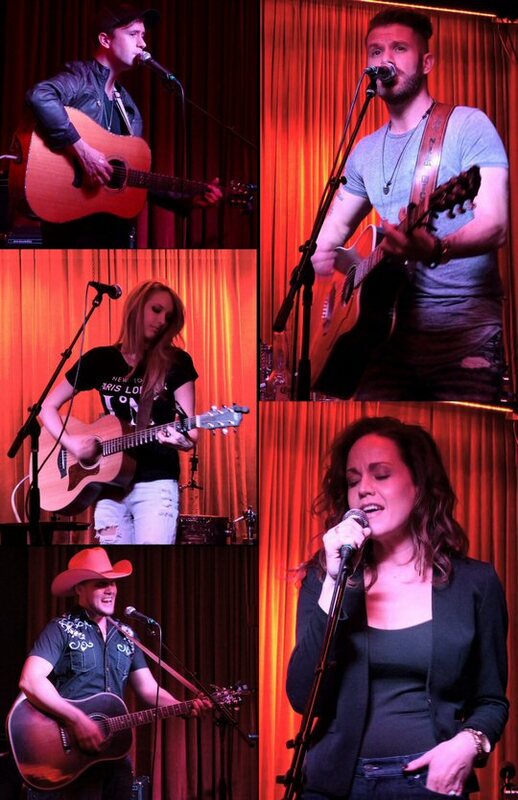 The two-hour showcase featured several impressive performances by up and coming artists Eric Lee Beddingfield, Nick Hickman, Bailey James, Rick Monroe, Melanie Meriney and Matt Hundley. Country acts Cyndi Thomson and Rick Monroe made appearances which offered a little more star power on a night when Nashville was basking in the genre’s brightest lights. 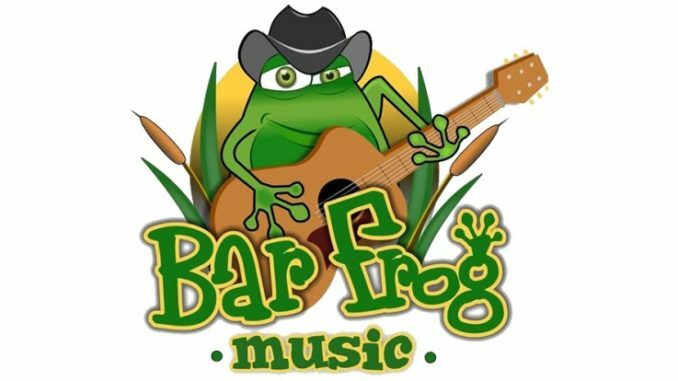 Serving as the evening’s host was Randy Barber – Bar Frog Music founder – whose experience as a songwriter and industry promotions specialist has given him an advantage in identifying a group of special talent that he is guiding up the charts straight outta Music City. In addition, his company provides a complete slate of promotion, publicity, production, marketing, touring, management and consulting opportunities to his artists. With the success of “No Umbrella” and other Bar Frog acts poised for big success – Barber should be expecting more honors in his future, too! More performers thrill the Bar Frog Pre-CMA Party at Nashville’s Blue Bar.